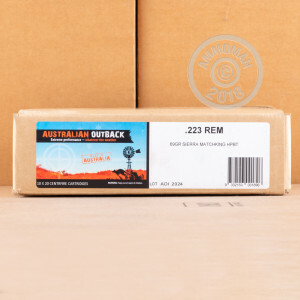 Send your targets down under with this Australian-made ammunition for your AR-15 or other .223/5.56 NATO rifle. Each cartridge in this box of 20 fires a heavy 69 grain Sierra MatchKing bullet at a muzzle velocity of nearly 3,000 feet per second. 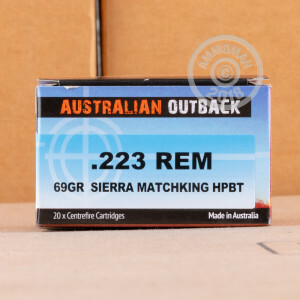 Sierra MatchKings are a competition-grade projectile known for their unerring accuracy. They have a boat-tailed base that enhances wind resistance and makes long-range shots a bit easier to make. These cartridges are manufactured by defense contractor ADI and use an advanced propellant featuring Ballistic Temperature Independence (BTI). 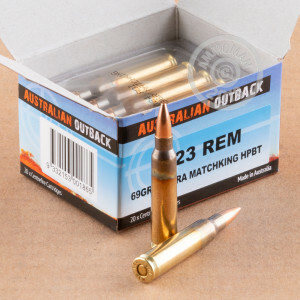 Formulated with the highly variable temperatures of Australian hunting grounds in mind, BTI propellants are designed to produce the same ballistic performance regardless of external weather conditions. Needless to say, this is a very useful property in many parts of the United States as well! This ammo uses non-corrosive Boxer primers and reloadable brass cases.